Get Inspired By Minerva Running + A Giveaway! Many of you already know Micaela Ellevold through the numerous training programs offered at Performance Running Outfitters. But did you also know that she is the owner and designer of a local running apparel company called Minerva? Below, she tells us how she got started and her inspiration for the fantastic designs! Can you tell us a bit about Minerva? Minerva is a women’s clothing and accessories line that expresses the relationship women have with running. We offer a variety of apparel options that currently include tanks, tees, hoodies and capris. Our accessories consist of coffee mugs, tote bags, shoe tags and even hair ties! After working many years in the running industry and coaching 5k, 10k and half marathon training programs – whose participants were mostly women – I felt a need to create a line of clothing that expressed how women felt about running; and when you saw other women wearing it – it made you smile, and say YES, I get it, that is TOTALLY me!! I had not found any apparel that spoke to me about running, so I decided I would combine my knowledge and experience with running with my creative and graphic design skills to start a new clothing line! Overall, I wanted to create a line that expressed what motivates and inspires women to run and how they grow and transform through their running journey. Most importantly, I want to encourage others to join the sport and become a part of the running community! Running has been a part of my life since my early days in high school. However, the last few years my passion for running has grown to building relationships, being a part of others’ running journeys and experiences, and enjoying the time and memories created with my “running peeps!” Through Minerva designs, I hope to continue to motivate, inspire and empower women to keep moving! What does Minerva mean and why did you decide it was the right name for the company? After doing some research on Roman mythology, I came across the name “Minerva”. She is the Roman goddess of wisdom and her symbol is the owl. I knew immediately that this was a perfect fit for my company because of my experience in coaching, the relationships I have built through running and my own running journey. Most women provide wisdom of their running journey through their experience, sharing stories and passing on information. The owl is also a perfect fit for Minerva’s logo, as the owl can be considered a representation of a messenger. I really like the art form of typography, and I like when the words create the art, tell the story and speak the message. Some of the designs are inspirational messages I have said to my participants through coaching or they come out of frustration and change that we go through. In most cases, the designs come from the heart from my personal relationship with running and journey over the years. I would have to say that some of my best designs and thoughts have come to mind when on a run and I am completely lost in my thoughts and my feet are in motion. 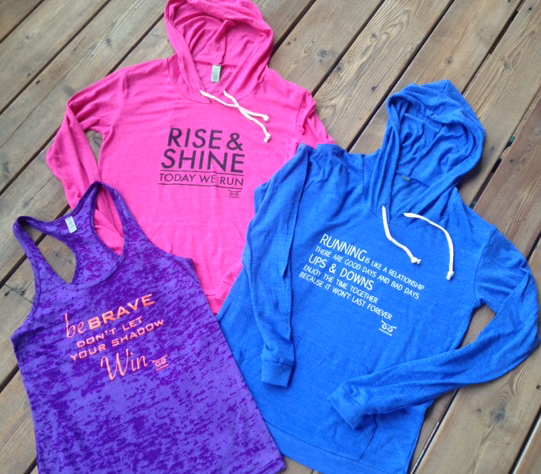 Right now two summer favorites are the “Rise & Shine” and “Running Relationship” hoodies!! I think the messages speak to each runner and are perfect reminders why we run! The hoodies are perfect to put on after a race or run and great for wearing to run errands or to the movies!! 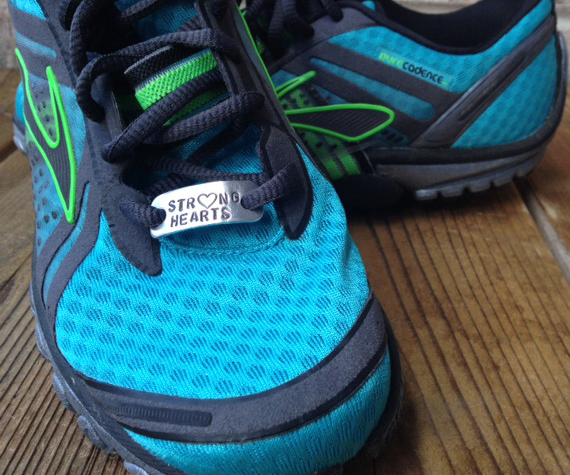 Another popular item is our “Strong Hearts” shoe tag. The “Strong Hearts” design was created to honor my Dad who passed away from an aortic dissection in February 2013. It also symbolizes love and support for anyone who has suffered from heart disease or illness, and pays tribute to all those lost and those who survived from aortic disease or heart disease. The design is to remind us that through tough times we are to continue to have “Strong Hearts,” to keep moving with purpose, and in the end remain strong. We are to continue to be proactive with our health, help others by bringing awareness, and each day put one foot in front of the other. Each year, a portion of the cost of each “ Strong Hearts” shoe tag, t-shirt, and bracelet sale will be donated to a different organization. Last year it was the John Ritter Foundation; this year it is the American Heart Association. Are there any new items in the works? We just released a few NEW items: a tank “Be Brave” and two light-weight hoodies “Rise & Shine” and “Running Relationship!” However, we have a few new tanks in the works that will be coming out in late July! Where can people buy Minerva clothing and accessories? Locally, Minerva products can be found at Performance Running Outfitters, at race expos throughout the Midwest, or through our online shop. How can people connect with Minerva? Is there anything else MKE should know about Minerva? 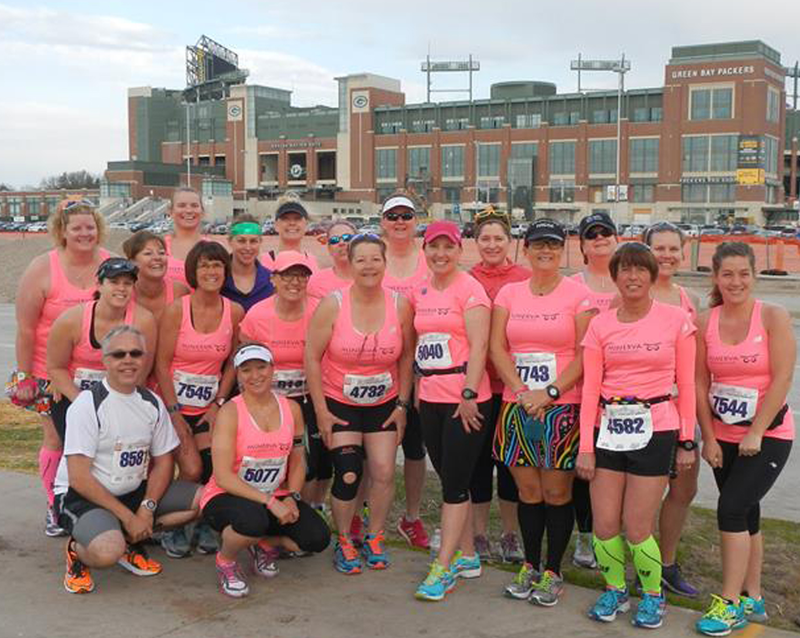 This past May, a group of twenty ladies from the area made the trip to Green Bay, WI to run the Cellcom Green Bay Half Marathon. It’s a race that I thoroughly enjoy running each year, and a race my family has run for the past six years. It started with an idea to run a race together and then on a snowy Saturday morning in February, all twenty ladies showed up to start training. This is where the “Muses” journey began! Over the twelve weeks of training, new friendships were formed, stories of running experiences were told, and for some this was a new distance to complete and others it would be another notch on their belt. Over a few long runs I came up with an idea of the “Minerva Muses” and I decided I was going to have this printed on a bright-colored shirt that everyone could wear. These shirts were so we could all find each other at the race or if we spotted each other on the course we could encourage one another to keep moving forward! We’ve come this far and we all are going to cross that finish line! In the end, all twenty ladies crossed the finished line and we all had so much fun! This was an experience that I will never forget! After the race I decided I wanted others to join the “Minerva Muses Running Club” and to be able to connect with each other! We all have a story, we all started somewhere, and we all run for a reason! So why not share your passion, tell your story, and encourage others to join the running community! You can connect with Minerva and other “Minerva Muses” on our Facebook page or at upcoming expos or races! Let’s celebrate our accomplishments and join together! Who wants to win some Minerva apparel? Minerva has generously provided a fabulous giveaway prize for one lucky Keep Running MKE reader. The winner will receive a Minerva running tank and tote – perfect for logging miles this summer! Good luck! We’ll announce the winner next Wednesday! *Winner will have 48 hours to claim their prize by emailing keeprunningmke@gmail.com. If the prize is not claimed within that time frame, we will select a new winner.